In Europe, Obama Will Seek Support For Syria Strike : The Two-Way While the president meets with world leaders in Sweden and Russia, members of Congress continue to debate his request for authorization to take military action. 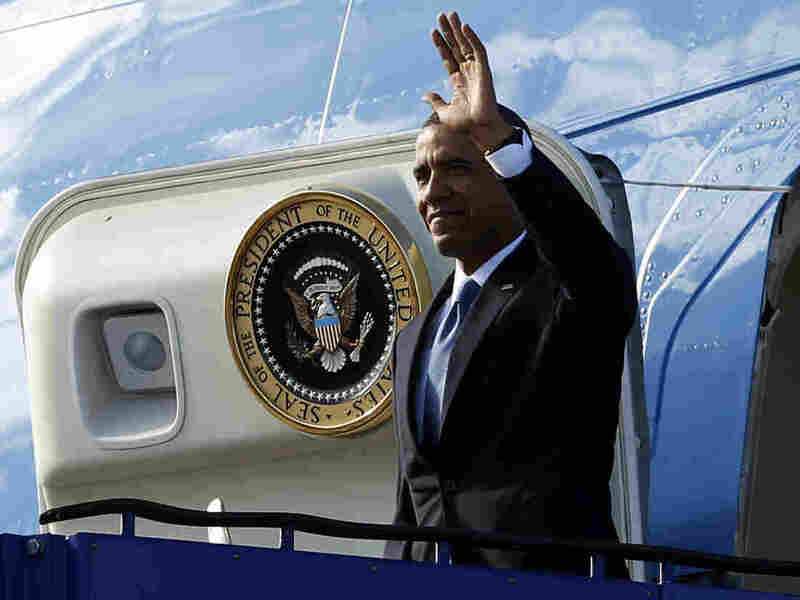 President Obama as he emerged from Air Force One early Wednesday in Stockholm. President Obama landed in Sweden on Wednesday — the start of a European trip that will take him to Russia for a summit of world leaders at which he'll try to build support for his plan to strike targets inside Syria. As The Washington Post says, it's a "high-stakes trip ... that could show whether the United States has broad international backing for action." The most prominent skeptic about taking military action in response to Syrian President Bashar Assad's alleged use of chemical weapons is the G20 Summit's host, Russian President Vladimir Putin. On Wednesday, Agence France Presse writes, Putin "suggested Russia could approve military strikes against the Syrian regime if the West presented watertight evidence of chemical weapons crimes but warned the use of force without U.N. approval would be an 'aggression.' "
The two-day G20 Summit is set to start Thursday in St. Petersburg. While Obama is in Europe, debate continues in Washington, D.C., over his request that Congress authorize military action against Syria. On Tuesday, as we reported, the leadership of the Senate Foreign Relations Committee "came to a bipartisan agreement that would allow President Obama to use force against Syria, but would also give him a time limit." Wednesday morning, the committee is expected to vote on that resolution. Over on the House side of the Capitol, the Foreign Affairs Committee meets at noon ET to hear from the same administration officials who testified before the Senate panel on Tuesday: Secretary of State John Kerry, Secretary of Defense Chuck Hagel and Joint Chiefs of Staff Chairman Gen. Martin Dempsey. We posted Tuesday about the "4 exchanges you should listen to" from the officials' Senate testimony. They're expected to get a more skeptical reception from the House members Wednesday.